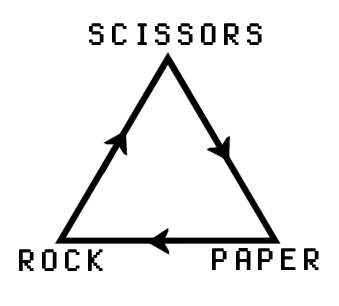 We can depict the game of Rock/Paper/Scissors with an equilateral triangle with R, P and S at each of the vertices. In this triangle, R beats, and therefore points to S which in turn points to P and P to R for similar reasons. I now want to use this logical map to unpack the ideas which have been floating around in my head for the past year or two. In order to do this, let us reinterpret the arrows as meaning “entails” or “leads to” rather than “beats”. Let us also replace “Rock” with “Religion”, “Scissors” with “Science” and “Paper” with “Pragmatism”. These are pretty rough and ready labels (we could have used “Revelation”, “Skepticism” and “Post-modernism”, etc. ), but I think they’re good enough to get the job done. Each of the three points has a different conception of truth which cannot be fully reconciled with those of the others. 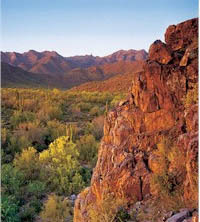 R sees truth as a path toward some destination which is transcends this world. S sees truth as an objective picture of the world. P sees truth as a contingent tool by which we navigate the world. Let me now tell a story which links the three points together. For a long time, people lived in a state of R wherein they cooperated with each other by obeying and enforcing those rules which essentially defined the path they took themselves to be on. Beliefs were true to the extent that they lead toward the transcendent destination. (Iron rod anyone?) However, people soon became uncomfortably aware of many different paths which other people seemed to be following. Whether these other paths ultimately lead to the same destination or not was unimportant. What was important was that following their particular path which its particular set of rules now seemed contingent, arbitrary and optional. It thus became imperative that they find some way of deciding which path was the “true” one. (Notice that the meaning of “truth” has already changed!) People thus embraced a number of rules which no reasonable person could disagree with, rules against contradicting observed experience or other known truths. These rules were usefully employed in the form of criticism (in order to eliminate opponents) and skepticism (in order to fortify themselves against their opponents). This practice, S, effectively eliminated essentially every reference to any destination which transcended this world and truth came to mean a fully consistent picture which corresponds to reality. Beliefs, then, were true to the extent that they accurately corresponded to reality. At this point, people within S began to notice that a complete correspondence between beliefs and reality seemed like a rather mysterious goal which was no more of this world than the transcendent destinations of R. In other words, S was really just one more path among all the others whose rules were entailed by a shared destination which constantly lay out of sight. Accordingly, the rules of S also came to seem contingent, arbitrary and optional to these people who came to be known as P. Of course, the fact that no set of rules or beliefs could be shown to be necessary, universal and binding did not mean that these rules must be bad or worthless. On the contrary, the people of P came to see beliefs as tools to use and live by and those beliefs were true to the extent that they were good tools to live by. At this point, however, the people of P began to ask themselves whether this belief concerning the nature of truth was itself a very useful tool to live by. Besides serving as a criticism of S, it did not seem to do much good, for tools can be put to at least as many purposes as there are people and preferences. In other words, the truth of P was like using an open field as a path in that it pointed nowhere and everywhere all at once. At any rate, there was clearly no longer any reason why two people were bound to tread the same path, let alone obey the rules which defined any such path. Thus, in order to live meaningful and fulfilling lives with those around them, it became expedient that they bind themselves together in a shared path which led to some destination not unlike the people of R.
Consequently, we have three states within a closed loop each of whose doubts and suspicions about the others serve to indicate the direction of its flow. R is the escape from the individualistic nihilism of P by way of a truth which is transcendent and sees S as leading right back to that mess. S is the escape from the irrationalism and superstition of R by way of a truth which is objective and sees P as leading right back to that mess. P is the escape from the delusions of objectivity and hypocrisy of S by way of a truth which is contingent and sees R as leading right back to that mess. The question now is where does one stop in this cycle? By whose criteria does he/she make such a choice? How does one justify this decision to those who have stopped at a different place? Is stopping at any point even justified at all? I think perhaps the only way to get out of the loop is to arrive at some transcendent way point along the path to the transcendent destination which either confirms or denies the existence of the final destination to the satisfaction of the observer. But some of us are harder to satisfy than others, so then it becomes a very subjective thing. It is hard for me to explain my paper scissors with stone edged blades. The Synthesis seems tenuous, and yet when I picked them up at the way point, they instantly became my most treasured possession. Sometimes I worry that they are a snowflake, one of a kind. I see others who have stone scissors that have paper handles and others who have thin stone tablets etched on with scissors. I marvel at the differences, and worry at them even more. And that’s when I realize that it isn’t the stone-edged paper scissors that I love. It is the memory of the way point I received them at which sustains me. Adopt each position. For that position, what problems arise? Now, decide which of the three sets of problems is more important for you to have solved. That’s where you stop in the cycle. If convincing others that you’re correct is part of that set of problems, then you’re emotionally justified in convincing others. After all, emotion is what motivates us to move. Of course the whole point is that each perspective has its own costs and benefits and that the rightness or wrongness of the choice can only be decided from within a perspective. Matt’s appeal to R definitely gives rich meaning and purpose to his life, but the claims of other paths, particularly those of S will always be a nagging problem. Anon’s appeal to P certainly owns up to the fact that asking which path is the right one is conceptually confused and makes him the owner of his own life choices, but the ultimate unaccountability to anybody or anything outside of himself is sure to leave him wanting more. There are three who testify in heaven: scissors, rock, and the paper; and these three are one. To be less glib, I found this post to be incredibly insightful. For me, I agree with #1, though I’d put it differently. I would say that all three, P, S, and R, might be three expressions of one, simpler, motivation/mode/truth. You said the three are not completely reconcilable. Perhaps that might be going too far. 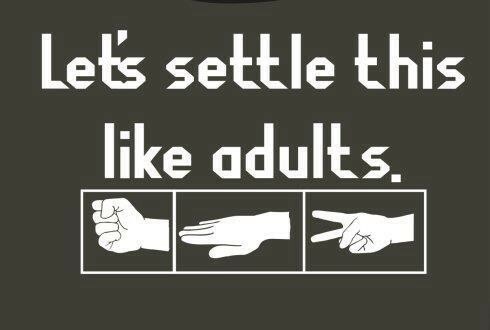 They are only irreconcilable if approached that way, but in the game of paper, rock, scissors, no one would say that the three are meant to be “reconciled” at all. Rather, they are three expressions that function best at different times during the game, and are defined by their relationships to the others. As for 5, I’m not sure what to think. I don’t like the idea of all “really” being expressions of the same truth, since reality and truth are themselves the products rather than the sources of each perspective. *However* I am quite partial to a second best hybrid of the three. What I have in mind is that any two perspectives could together leverage themselves against the excesses of the third. In other words, any pure perspective which disregards or violates the other two will likely not do well. No apologies necessary! My post is itself just such an attempt. However, it must be noted that the fact/value distinction does not make sense outside of S which sees itself as painting an objective picture of values. If truth is instead a path in R which leads the way then facts and values are inseparably connected. (I wonder whether my account points in the right direction or not!). P would see my account as simply one more means to my own ends and values. (I think it’s a helpful one, but others might disagree. ). Finally, my attempt to describe things from S is really an attempt to circumscribe all values which do not directly determine facts under those which do. But who, other than S, thinks that they ought to? Excellent post Jeff. I just finished reading William James’ Pragmatism. It seemed that he viewed Pragmatism as the middle ground between Science and religion (if I understood right). Still trying to sort it out. Yeah, I actually just read a paper by Rorty which argued thatany of James’ views towards religious belief were contrary to the spirit of pragmatism and that Dewey’s views were more consistent. Of course Dewey’s pragmatism was largely fueled by the view that S was simply religion by a different name and that pragmatism was to finally shake ourselves totally free of religion. I think that rorty is right about what a consistent pragmatism entails, but wrong in assuming that pragmatism necessarily holds us to such consistency. In other words, I think that P is orthogonal to the R-S spectrum, but this doesn’t mean it isn’t a path from S back to R all the same. Maybe the triangle is really a spiral that leads up and up towards Good. Or maybe that is just the Practical in me talking. All truth can be circumscribed into one great whole, sometimes paradoxically. Thanks for stopping by, Rich! I could be wrong, but your comments seem more like that of a Rock than a Scissor. If I understand you right, you are framing it in terms of a path with a destination. That is how I see your claim that there is a context independent “good” which is both universal and paradoxical in nature. This is certainly a justifiable claim from R’s perspective, but S and P are going to have issues….. But so what, right? R will have need with their claims as well. Congratulations, Jeff G. You’ve just given us a possible psychological explanation for the observations that James Fowler made in his book “Stages of Faith.” Well done. I guess I’ll have to check that out, Bill. I know absolutely nothing about it.